Mandatory evacuations are in place (as of 8 PM Sat.) at the Meadows; all residences north of Loma Alta Dr. between Lake Ave. and Canyon Crest, above JPL including Camp Chiquita. We know that voluntary evacs are in place in several areas around town, including West Altadena Dr. and the Florecita area in northwest Pasadena. Evacuation centers are established at La Canada High School (evac and shelter), 4463 Oak Grove Dr. LCF; Jackson Elementary (evac only) 593 W. Woodbury, Altadena; and Crescenta Valley High School (evac only), 2290 Community Ave., La Crescenta. We have heard on the ground that Jackson Elementary is locked up, but haven't had a chance to check it out ourselves, so caveat emptor. As we go through the day, we urge you to check out the Comments section here, too, as all our wonderful readers are a font of good information. A word before we begin: please check ALL media resources regarding this fire -- TV, radio (KFWB 980 AM, KNX 1070, KPCC 89.3 FM), print, and online. We're just one guy who's juggling this with two special needs kids and a wife in the hospital, hardly optimal conditions! TV has not been as big a player in this fire as we'd hoped, probably because no celebrities are in danger of being harmed. Use everything you've got! Also: we probably can't respond to specific email requests (where do I put my animals, I'm on vacation and is my neighborhood safe, etc.) Things are coming in hard and fast. If you slog through the posts and comments over the last few days, you'll probably find what you're looking for! Prayers go out to our firefighters, those displaced, and those worried sick. Prayers for the two firefighters lost near Acton. Sharing some video from frequent commenter Isaac Garcia of the DC-10 making a drop on Saturday. Eighteen homes have now been destroyed by the Station fire, which has burned 42,500 acres in the Angeles National Forest, fire officials said Sunday evening. The blaze is 5% contained. It continues to threaten Mt. Wilson, home to a 105-year-old observatory and transmitters used by television and radio stations, cellphone providers and numerous law-enforcement agencies, including the FBI, CIA and the Secret Service. The fire is pushing toward the Acton area to the north and Sunland to the west. Firefighters were able to stop the fire from approaching homes in Glendale, La CaÃ±ada Flintridge and La Crescenta. Two TV stations said tonight that their transmitters are threatened by the Station fire, which is burning near the communications center atop Mt. Wilson. New firefighter deployments: Strike teams forming for Mt. Lowe: Bill Westphal says as of 5 PM firefighter strike teams are forming to tackle the Mt. Lowe motorway, where fire has crossed several spots. Firefighters are also testing hydrant water pressure on the Skyview cul de sac above Loma Alta. Sam Nemati reports as of 5:30 that the voluntary evac is lifted for Crestford Dr. area. which includes chatter from the water-dropping choppers. Will definitely check it out tomorrow. UPDATE 7:30 PM: Back from a necessary pool break with the children, who are now more controllable! Thanks to all of you feeding information into the comments section -- we are so grateful for our readers and reporters, helping keep the community informed. It was kind of a working break -- we were in the Floricita area, and it was like Saigon, 1974 -- mulitple choppers overhead and firefighting tankers, taking on the hillsides and Mt. Wilson. This is a major effort, and easily the biggest story of 2009. Greg Garner took this picture of a phoscheck drop on Mt. Wilson. We're going through the emails, and will be filling in periodically through the night. UPDATE 3 PM: Only here for a few minutes -- the kids have been invited to a pool party, and REALLY need to get out of the house -- will have fuller updates in the evening. However, it is grand to see the sky clearing and he helicopters making their drops. Woo-hoo! Also, we have lifted the moderation on comments (we went to moderation because there was an attack of libelous comments awhile back). The comments and information they share have been so valuable that we want 'em out ASAP. So please, the comment boards are for fire information only (compliments are nice, too!) Anybody who wants to namecall, spam, go off-topic, or troll (and we've already had one of those today) will be erased as soon as we find them and banned for life without possibility of parole, as we are not in a mood for nonsense today. The bullet: no new evacs in Altadena, and the mandatory evacuation areas remain so now. Alice Wesson of the Chaney Trail fire council says she observed a flareup around Zorthian ranch, so we're not in the clear yet. 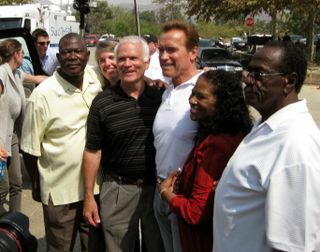 Meantime, here are members of the Altadena Town Council posing with some pol earlier today. UPDATE: I drove by at 10:30pm last night. Jackson Elementary is closed. I drove to La Canada High School and spoke directly with the Red Cross public information officer there. He told me that La Canada High School is the evacuation center for Altadena. La Canada High School seemed very well equipped. The Red Cross has already set up, along with the Humane Society. I spoke with Humane Society worker Bob Fiddler, and the one thing he asked is that if people do need to evacuate with their pets, it's better to take the pets directly to the Pasadena Humane Society rather than to the evacuation center. The pets have to sit in crates under the shade at the evacuation centers until they can get them to the Humane Society. It's more comfortable for the pets to just be dropped off at the Society than spend time sitting in a crate. UPDATE 10 AM: Sorry, folks, but we will be out of pocket for several hours to make a hospital visit. Please continue to send us your news and observations -- we'll play a mighty game of catch-up when we return. And make use of all your other media resources -- radio (rumor has it KFI 640 will be covering fires today), TV (if some celebrity's in danger of getting singed), and the PSN and LATimes newspaper sites, which are very good. We'll be using those plus scanner in the interim. 1. I drove over to Lincoln and Loma Alta this morning. Per the Sherriff, no further activity in The Meadows last night. Very smoky outside this morning. Still not allowing people into The Meadows. Per a neighbor, all but a skeleton crew of firefighters pulled out of The Meadows at 7:30 p.m. (Not verified with the Fire Department.) Per a neighbor, the fire did come into The Meadows on the vacant land on the west of Risinghill Road at the top of the road but was extinguished by the flame retardant that was dropped repeatedly over the hill. Also, per a neighbor, Theo's house at the very top of Risinghill was protected by fire crews. If anyone has other updates, please email to me. 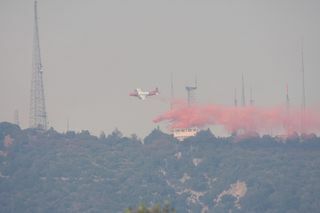 Air power: The scanner-monitoring Tom Rosebrook says that, due to smoke, air attack will not begin until at least 10 AM. Rumor has it that a superscooper will be on its way today from Ontario, CA, to protect Mt. Wilson. Inside SoCal has a list of links. Lonnee Hamilton's Obamaworks blog lists ways you can help. Second, the parking lot at Ronnie's Garage on Lake and Morada is available for any vehicle that needs to be brought off the hillside. Just drop it off and call me at 626-543-4844. Any help I can provide, call too. Temperature 74.7°, 10% Humidity and wind from the Northeast (27°) at 4 MPH. Forecast is for clear skies and 100°. Just heard the first Helicopters. Situation looks better at this point. Altadena WeatherCam set another one day record yesterday with 14,677 hits from 2,480 unique viewers. WOW ! Looking forward to a better day.